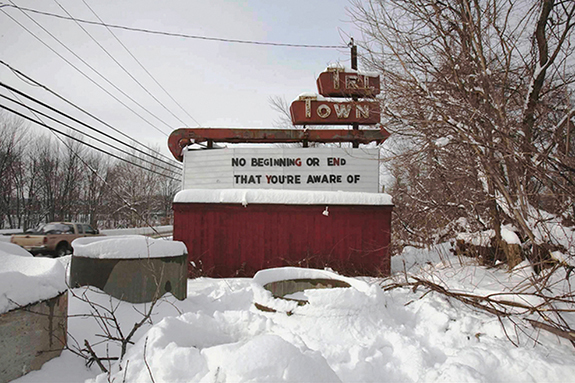 This project uses photography to document my text interventions on roadside marquee signs. The work addresses the effect of media and technology upon human desire. I place phrases on movie and motel marquee signs, many of which I find through research but also in the course of my frequent long distance travel by car. I use my own sign letters, installing them while filming the placing of the phrases and then leaving the scene with words left intact upon the sign. Afterward I make my photograph of the finished sign from the sidewalk or roadside, shooting from the vantage point of the driver or pedestrian. I use a large format camera and make large-scale color prints as documents of the sign in its environment. 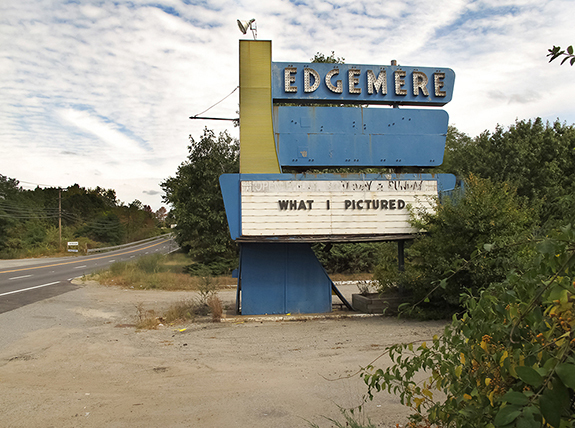 The photograph becomes the sole remnant of the project as the signs inevitably disappear or are taken down. In its brief existence, each sign installation is read by an audience comprised mostly of people in cars or by roadside foot traffic. The experience of the viewer seeing the work in the context of the outside world of roads, signs and billboards is important to me. I am interested in viewers encountering my work in spaces they expect to see advertising or propaganda. The text phrases are the voice of an individual, deliberately personal yet sounding mysteriously familiar through the fragmented vernacular used within the spectacle of advertising. I use language that references aspirations toward contentment and fulfillment linked to promises of desire and romance provided by the realm of commodity and entertainment. My texts are formulated to read as regurgitations of that, as though they are public diary entries pertaining to banal realities of self and relationships based on comparison with an ideal.